The weather to the East wasn’t looking so great, but to the North and West it was a lot better, so we decided to fly to Wellsbourne today (instead of re-doing the Brize Zone Transit). This would be my first land-away, and I was very excited! Wellesbourne is only a short 27nm from Gloucester and after a bit of fiddling with the Flight Computer I calculated the flight time to be a tiny 12 minutes. 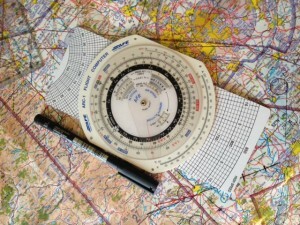 Planning a trip to a new airfield adds extra complexity to the flight planning. First you need to read the airfield information (in the AIP and/or Pooleys/AFE guides), check the runway is long enough, make sure it’s open, learn the noise abatement procedure, etc. I phoned Wellesbourne tower to find out the weather, active runway and circuit direction, then asked to book in. After giving them my details and filling out the usual paperwork, we were ready to go to the aircraft. I took a passenger in the rear seat (one of the other instructors, who had some spare time and fancied a trip up to Wellesbourne) so also needed to do weight and balance calculations. I did an A-check, then taxied for fuel. We filled up and were on our way. 22 was the active runway, with a right hand circuit, so after departure I turned right as if I was in the circuit, then climbed up and out before changing to the planned heading of 049. At the quarter way point, abeam Tewksbury, I noticed we were much closer to Tewksbury than we should have been. Turns out I had been flying the wrong heading – 039 instead of 049. I estimated (by looking at the fan line I had previously drawn on the map) that we were approximately 10 degrees off track. To correct for this, I had to fly 059 (desired heading + the amount we were off). This is different to how you’d correct track-error for wind, where you’d correct by 1.5 x TE at the quarter way point. After changing my heading, I changed frequency to Wellesbourne and made my initial call “Wellesbourne Information, Aeros 53”. I was expecting a “pass your message” and to have to do the usual CARPACER but I got back “Aeros 53, we have your details, runway 18 right hand is active QNH 991HP”. So I just had to readback the active runway, circuit direction and QNH. On we went. At the half-way point we were still left of track, so I corrected my heading further. As the airfield became visible, I changed to QFE and made a radio call reporting the airfield was in sight. Wellesbourne actually has a Flight Information Service Officer (FISO) and has a Radio callsign, not Information (which is for Air/Ground Services). They corrected me and asked me to report downwind. That told me! Whoops, I must have mis-read the airfield details in my book. Soon enough I was descending on the deadside and then flying the slightly-awkward noise abatement circuit pattern for 18 right hand, where you extend the base leg beyond the runway centreline, only to then turn back and fly an angled approach until the last minute where you turn to the runway heading. There was a pretty strong crosswind, which made for a challenging landing but I got us down safely and was soon taxing to parking. Parking at Wellesbourne is on grass, so this was my first time on grass. When changing surface (from tarmac to grass, or vice versa) you should do so at 45 degrees to the surface so that one wheel transitions first. Soon enough the engine was off, shutdown checks complete and we were off for coffee. I’d successfully done my first land-away! After a coffee and quick chat with some of the Aeros Wellesbourne staff, we were back in the aircraft and ready to head home. Because of the headwind, the flight back was planned to take 22 minutes, nearly double the outward time. A Flight Information Service Officer issues instructions to aircraft on the ground up to the manoeuvring area. So requesting taxi is the same radio call as from Gloucester (with ATC) – “Aeros 53 on grass parking, request taxi”. Because Wellesbourne doesn’t have an ATZ, we don’t know (and can’t give) the QNH, so the FISO includes the essential aerodrome information in their reply: “Aeros 53, taxi holding point Alpha for runway 18, right hand, QNH 991HP”. Then it’s just the usual read back: “Taxi holding point Alpha for runway 18 right hand, QNH 991HP”. When ready for departure, you make the usual “Ready for departure” call. The response from an FISO is different to that of an ATC, as FISO can not issue clearances for landing or take off. So the response will typically include a wind check, details of any known traffic, followed by “take off at your discretion”. You as the pilot in command then need to make a decision on whether it’s safe to take-off or not. You then call “Aeros 53, taking off” or “Aeros 53, lining up” or “Aeros 53 holding”. The wind had turned to a slight tailwind, which means a longer take off run. The runway was plenty long enough even with a tailwind, so it wasn’t a big deal on this occasion. Why they didn’t change the active runway confuses me though – surely it would have been better for everyone to change to 36? We were up in the air and heading back towards Gloucester. The journey back felt (because it was!) much slower but even a 20 minute flight is over before you know it. After telling Wellesbourne I was switching to Gloucester, I called them up and asked for Join instructions: “Gloucester Approach, Aeros 53, request join”. “Aeros 53, Gloucester Approach, pass your message”. This is the first time I’ve had to do the CARPACER stuff with Gloucester as I had always been doing a rejoin up until now, not a join. They cleared me for a standard overhead join, which I later radioed back and asked if we could change to a direct straight in join. They approved, which meant I could do a long final approach. The landing was fairly uneventful and we were soon back at Aeros Gloucester for another cup of coffee. Our planned route would be: Gloucester -> Moreton on Marsh -> Grove -> Gloucester. The purpose of this lesson is to get more navigation practice but also practice radio talk, specifically how to transit Class D airspace (the Brize CTR). I had already mapped out the route on my chart (we were supposed to do this route last lesson, but the weather changed that plan…) so after my instructor checked my PLOG we talked through the radio element. They’ll normally ask you to Squawk (set your transponder code) to a specified number, so they can identify you on their radar. This is not a clearance! With a bit of luck, you will then be issued a clearance to transit the zone, with any specified conditions. If you don’t get a response you must not enter the airspace – remain outside and consider calling the again to give them an update. The weather looked fine, so we headed out to the aircraft. After doing an A-check we were soon taxying to the runway. Runway 27 was active today, and our initial heading was 70 degrees. So instead of starting the stopwatch on take-off, we would take off heading 270 and continue as if we were in the circuit (right hand) except we’d continue climbing above circuit height. Once we were abeam the runway (eg downwind) we could start the stopwatch and once at a safe height (clear of circuit and overhead traffic) turn to our desired heading. At the quarter-way point, I was looking out for Cheltenham Racecourse, which we were due to fly right over. On time, and on track, I continued to do a FREDA check. I then asked Gloucester Approach for a frequency change to Brize Radar, which was approved, so I twiddled with the radio knob and soon enough I could hear traffic on the Brize frequency. I made my initial call: “Brize Radar, Aeros 53, Zone Transit”. No waiting around, with an instant reply: “Aeros 53, Pass your details”. I wasn’t expecting that so quickly! So I went in with my call: “Aeros 53, PA28, Routing Gloucester, Moreton on Marsh, Grove, Gloucester at altitude 3800 feet QNH 1011, request zone transit”. In the heat of the moment I had misread the altitude – we were actually flying at 2800ft. So their response: “At 3800ft you’re above the zone” (the zone extends from surface to 3500ft above sea level). So my instructor corrected me and said we’re at 2800ft. Brize then asked where we wanted to transit the zone as Morton on Marsh was to the north of the zone. So we said “we are routing Morton on Marsh to Grove and would like to transit the zone bebtween Morton on Marsh and Grove”. Finally, we were given a squawk 3702 and a basic service. A minute or so later, we received another radio call “Aeros 53, Little Rissington, something, something active”. Obviously he didn’t actually say something but I couldn’t understand what he had said. So after asking for clarification, it was “Little Rissington, Abbingdon, Chiltern Park are active” – three parachute drop zones. Little Rissgton was a couple of miles off our route and I could see it on the map fairly quickly. After a bit of looking around, I found Abbingdon – 7nm east of our track, and only now I’m back have I found Chiltern Park – a good 13nm south east of Grove. So that was pretty confusing. Now I’m not complaining (this is all good learning) but it was pretty confusing when you’re expecting one thing and hear something else. I’m not looking for sympathy but trying to explain the circumstances surrounding the next issue…All this radio chatter had taken a lot of time and we were now about 2 minutes before the ETA for Moreton on Marsh. I couldn’t see it ahead of us, and looking to the left and right I could see features that I wasn’t expecting to see from our track. I was lost. So we go in to the standard ‘unsure of position’ procedure. Look ground to map. Try and find distinctive ground features and then locate them on the map. Orbit a town whilst you try to identify it. Eventually (about 15 minutes later) we had identified ourselves orbiting Chipping Norton – a good way South East of our desired track. No idea how we managed to get there… So now I could turn North West to get to Morton On Marsh. A few minutes later and we were overhead the disused airfield at Morton On Marsh, which was a huge relief. It’s really quite disorientating and a little bit scary when you have no idea where you are. My instructor acted as if he was lost too, but I’m pretty certain he knew where we were and was just testing me to see how I’d cope. From there on, everything else proceeded as planned. Flying the planned heading took us along the desired track, Brize cleared us to transit the zone whilst flying South towards Grove, and again North West towards Gloucester. Approaching Gloucester from the West was a first for me, it’s funny how the same airfield that you’re familiar with can seem completely different from another angle. Particularly as there are hills to the West, so you go from being fairly close to the ground to being quite high. We requested (and were cleared for) direct join left base for 27. Next lesson we’d have another go at doing this again – hopefully without getting lost in the process! After doing a lot of head scratching, and re-watching the GoPro video, I am still not really sure how we managed to get so far off track. My main theory is that the wind was stronger and from a different direction to that forecast, but I’m not sure why that didn’t mess up the other two legs. The main thing I take away from this is to remember the order of tasks: Aviate, Navigate, Communicate. I was focusing on the third-most important thing, to the detriment of the other two. The weather was pretty shocking today (low cloud) so instead of the planned ‘Brize Zone Transit’ lesson, we’d do a low-level navigation training exercise. Why bother practicing with low level navigation? Surely you’ll be flying at a reasonable height all the time anyway? Well, yes, you would hope. That should be the case. However this lesson is taught because if you find yourself flying and caught below a low-level cloud base (imagine flying towards a hill, the cloud descends below the hill and you can’t divert around..you’ll have to turn back) then it’s good to know what to expect ahead of time. The last thing you want to do is go above the cloud and inadvertently enter IMC conditions. First, diversions. Say you’re flying a heading and for some reason (weather, terrain, airspace) you need to go off your desired track for a bit and rejoin it later. Say there’s a hill at 2000ft and you’re flying at 1900 ft with the cloud at 2000ft. You wouldn’t want to fly straight in to it, would you!? So in this case you’d need to divert around it. The principle is pretty straight forward: turn 45 (or 60) degrees off track, making sure you start a stop watch when you turn. Once you have flown sufficiently far enough to avoid the obstruction, turn back to your original heading so that you’re flying parallel to your original track, and stop the stopwatch. Fly parallel for a while, enough to sufficiently clear the obstruction, then turn 45 (or 60) degrees back towards your original track. Again, start the stop watch. You should be back on your original track once you have been flying for the same amount of time as your original diversion leg. You can then turn back on to your planned heading and update your ETA to reflect the time spent faffing around (I mean diverting). Your revised ETA will be original ETA + time spent flying at 45 or 60 degrees. Eg. If you’re flying 250, then turn 295 for 2 minutes to fly around a hill, then continue parallel (heading 250) for a further 5 minutes, before flying 205 for 2 minutes, your revised ETA will be original ETA + (2 + 2) minutes. Obviously 45 degrees is the most efficient angle to turn, but if that’s insufficient, you’d turn 60. Low level navigation follows the same principles as nav at higher levels, but it sure feels different. At the risk of stating the obvious, you feel a lot lower – those buildings seem much closer and the hills much taller. Terrain also passes below you at a much faster rate – it seems as if you’re flying at twice the speed as when you’re up high, but obviously you aren’t. It’s easier to see line features and because you’re amongst the hills instead of above them, there’s no height to flatten them out, so the contours of the hills are much more visible. You can’t see as far, and things you’re normally used to seeing easily are suddenly very difficult to find. Precautionary forced landings are pretty much what they sound like. Your engine hasn’t cut out, you can control the aircraft perfectly well, but for instance the weather may have deteriorated so quickly and so badly that you are unable to safely fly in VMC to any airfield. Short of flying around in circles waiting for the weather to clear (which may end up in your fuel running out) then your priority should be to find somewhere to land safely. Much with the other type of PFL, you first need to select a suitable field/site using the SSSSSSS rules. Then fly a circuit over the designated area, at 1000ft, looking out for any obstacles or reasons why the chosen field is no good. Then, do another circuit at 300ft, giving you a better view. You could even choose to do a final circuit at 100ft before landing. The lesson went well, although as it turned out, the weather was a lot better by the time we got flying, so we could have done the planned Brize Transit lesson after all. Nevermind, we’ll do that next lesson. After flying the route three times with an instructor, today was my chance to fly it alone. Pre-flight planning checks complete, I walked out to the plane to do my A-check. Everything looked good so I completed the paperwork, phoned the tower to book-out, and got started. The wind was fairly calm, so each leg would take approximately the same amount of time. I was soon up in the air, at about 2,200ft. Cloud base was at around 2,400ft and whilst it looked like a lovely, clear sunny day from the ground, there was a noticable amount of haze up at that height. Visibility was around 10km so it wouldn’t be a problem, but it was an interesting learning to see how things can be so different on the ground. The flight proceeded to plan and everything went well. I missed ‘Student’ from a couple of my radio calls (and was quickly corrected by the tower!) but apart from that I was happy with how things went. 5 weeks after my last lesson (we’ve had some of the worst weather on record), the weather was looking good for my next slot. I’ve taken to booking double slots (in an attempt to ‘catch up’ on all the missed lessons lately) and that meant today I would be flying twice. Woohoo. First up, we’d fly the same route as before, but in reverse: Gloucester to Hereford, Hereford to Chepstow and Chepstow back to Gloucester. Weather forecast obtained, NOTAMs checked, PLOG updated and we were in the plane. I totally forgot to set up the GoPro in this lesson, and my memory is terrible, so I can’t really tell you how it went. I made it back ok and there certainly weren’t any disasters along the way, so I assume everything went well! After a short break for food and coffee, we went out for the next lesson, flying the same route but this time the same way as the the original lesson. We were to treat this flight as if I were the only occupant of the plane – pretend my instructor wasn’t there. The idea being that if it goes well, I’ll be able to fly this route solo next. This time I remembered the GoPro, and mounted it on the dashboard (for the first time) to try and give a ‘cockpit view’. Everything went well (except me joining right base for 27 and almost turning final for 22 by mistake, but I realised before I made the mistake – it’s easily done!) and my instructor was pleased with how it went, so said that I’m ready to fly the route solo next time. After many weeks of cancellations due to the terrible weather, I finally got back up in the air recently for my first navigation lesson. A couple of weeks before hand, because of the bad weather we decided to spend a couple of hours doing ground school in preparation for the upcoming navigation lessons. The majority of the remaining lessons focus on navigation and as you’d expect, it’s not something you’d want to be crap at. Weight and balance – are you able to fly the planned route with the fuel, passengers and luggage that you are planning to take? Alternatives – what airfields can you divert to if the weather turns bad? As well as all this, you have the job of planning which route you want to take. This sounds like a fairly straightforward process – and can be – but can get very complicated very quickly if your route is surrounded by complex restricted airspace. 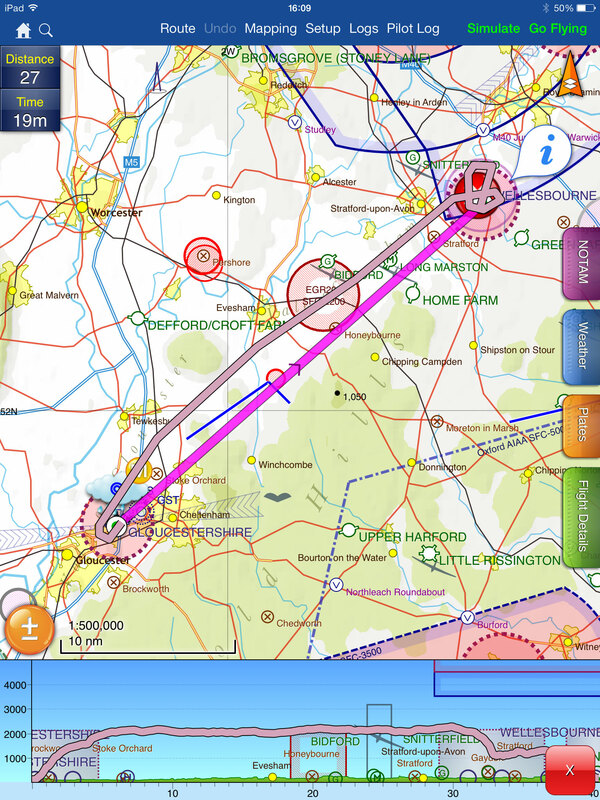 In principle, to plan your route, take your aeronautical VFR chart (map) and draw a straight line from your departure airfield to your destination. This will be the shortest route. Next, look along the route to see if it passes through any controlled airspace, danger areas, restricted areas, gliding sites, parachute drop zones and other potential hazards. You then need to alter your route to accommodate all these things. Then you need to measure the distance of each part of your route, as well as the angle between each point. Once you have the distance (in nautical miles) and the true heading, you plot them in a PLOG (which is essentially your route, written down on paper). You then need to calculate the heading to fly, and the estimated time taken to each fly each leg. Both these things very much depend on the wind. To do this, you use a flight computer. A flight computer sounds very fancy and technical, but in reality is 1950’s technology – a simple slide rule. The Flight Calculator – no batteries required! The flight calculator uses the triangle of velocities to give you a ground speed and wind correction angle, given the wind speed and direction and your intended heading and air speed. You plot the heading on your PLOG, then flip the flight calculator over to calculate how long it will take to fly the distance at that speed. Write the estimated time in the PLOG. Finally, you need to convert from true heading to magnetic heading and compass heading. 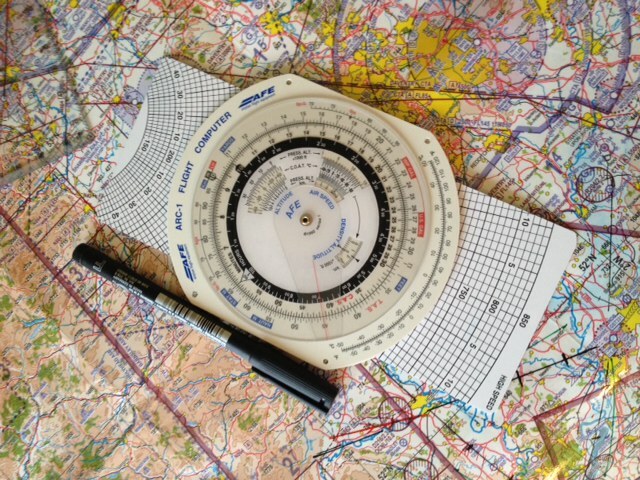 Magnetic heading is true direction adjusted for variation (you learn more about this when studying for the nav exam), whilst compass heading is magnetic heading adjusted for the deviation of your aircraft’s compass. Got all that? Simple. So now we have a route, with headings to fly, distances and times for each leg. What about altitude? How do you decide how high to fly? Firstly, you go back to your chart and look along each leg of your route. You need to look 5nm either side of the planned track for the highest feature – terrain or obstruction – shown on the map. For example, you may see a wind turbine with an indicated altitude of 1,235ft above sea level. Or it may be a hill that peaks at 1,354ft. Now we calculate the minimum safe altitude. Round the highest point up to the next 100ft, eg (1235 to 1300). If it’s terrain, you need to allow for a potential obstacle on the top of it (as VFR charts don’t show obstructions below 300ft). So take the rounded height and add 300ft. Finally, add 1000ft to give us our MSA. 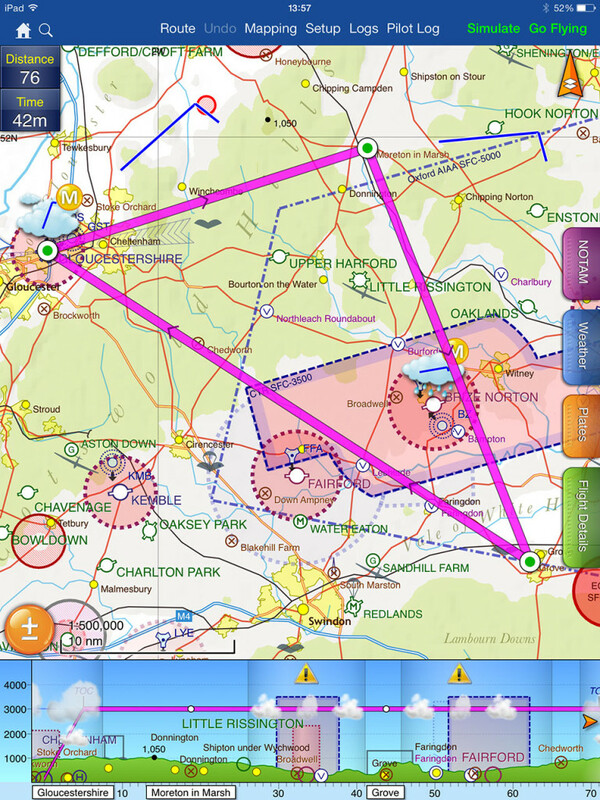 Because the UK VFR 1:500,000 chart doesn’t depict terrain below 500ft and obstructions below 300ft, even on what appears to be a clear patch of land you have an MSA of 1,800 ft. This is because you could potentially have an obstruction of 299ft on terrain of 499ft. When rounded up, this gives us 800ft, plus the 1000ft = 1800ft. We don’t have to fly at or above the MSA, we can safely fly below the MSA in good visibility with clear sight of the surface and of 10km or more ahead. So, why do we calculate it? It’s a safety net, there for us if we inadvertently fly in to instrument meteorological conditions (IMC) for which our licence doesn’t allow us to legally fly. This would be a bad place to get to, but it can happen. If it does, the first thing you should do is ensure that you are flying at or above your MSA. So even if you cannot see the ground or terrain, you know that you are above the highest terrain around you and therefore are not at risk of controlled flight in to terrain. After learning all this, I planned my first route. 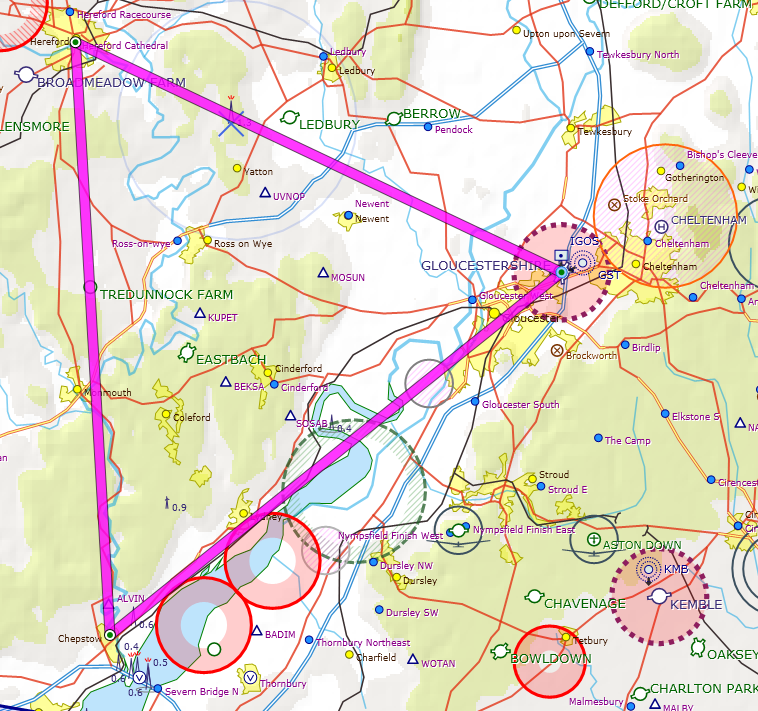 We’d be flying in a triangle, from Gloucester down to Chepstow, up to Hereford and back down to Gloucester. Each leg is about the same distance, but with today’s wind they would take 18 minutes, 13 minutes and 11 minutes respectively. The principles of navigation rely on dead-reckoning, not GPS. It’s all about timing. Before setting off, you mark the quarter, half and three-quarter way points of each leg on your map. Then when in the plane, you start a stopwatch at the beginning of each leg. Because you have calculated an estimated time for each leg, when you have been flying for quarter of the estimated time, you look on the chart to see what you’d expect to see on the ground. Then you look on the ground and determine whether you are where you expected to be. You could be somewhere different to where you were expecting to be for numerous reasons – the wind could be stronger, lighter or in a different direction to forecast. You may have accidentally been flying the wrong heading. There are a bunch of things you can do to make corrections but I’ll cover this in another post. After being cleared for take-off, as I entered the runway I had another task to add to my ATPL runway checks (Anti-Collision Light, Transponder, Pitot Heat, Landing Light) – start the stop watch! Soon we were climbing away. At around 1000ft it’s time to turn to your first heading. After turning on the heading, perform a gross error check to make sure you’re flying in roughly the right direction. Look at the map and the ground to make sure you’re heading the right way. Everything happened so quickly. Before I knew it, we were at the quarter-way time. I looked at the chart and I looked down below, and we were in the right place at the right time. Same with the half way point. Three-quarter way point was on time too. Finally we reached Chepstow with the Severn Bridges off to our left. I turned to the new heading, noted the time and filled out the ‘estimate’ time for Hereford. I then got on the radio to give my position report. So far so good, and on it continued until Hereford. We arrived there on schedule and turned back towards Gloucester. However on this leg, we appeared to be to the right of our intended track, so I had to correct for this by turning left. Back on the ground after some reflection, I concluded that I turned too early. I could see Hereford but we were not flying above it. Looking at my GPS log, I actually turned about 2nm too early, so even though we were flying the correct heading, we ended up 2nm south of where we wanted to be. Not a biggie – and useful learning for the future. Make sure you’re overhead the place – being able to see it is not the point to turn! I then made a standard overhead join and joined a fairly busy circuit. Landing went well. Next lesson we’ll be doing the same route, but in reverse. Practicing emergency landings is a bit like paying for car insurance. You really hope you’ll never need to use it, but you’re bloody greatful for it if and when the time comes. I’d be flying with a new instructor today (this’ll be the 4th!) as my schedule meant I couldn’t make it with my usual ones without waiting another week. Thankfully, the PFL lesson is fairly self-contained so it doesn’t matter too much. 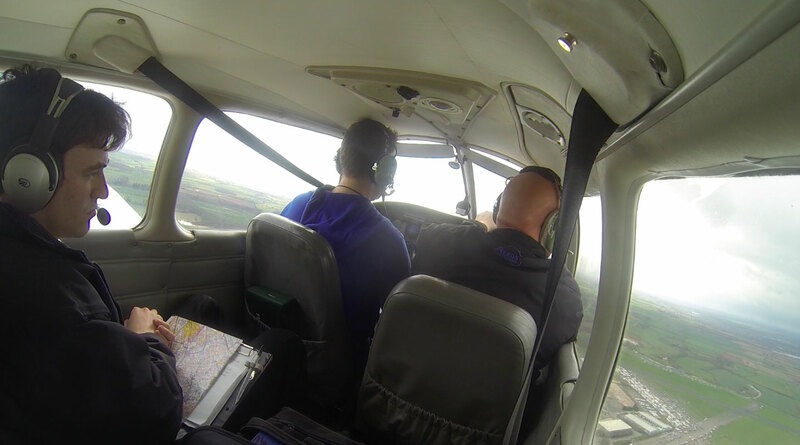 In fact, as I’ve found when flying for the first time with my other instructors, it’s normally a beneficial experience as I pick up new tips and learn things I hadn’t already been taught. Before the lesson, we had a fairly lengthy pre-flight briefing talking through what we’d be doing. There are many different ways of executing a forced landing – my learning to fly book has 2 methods, and there are plenty of other ways too. My instructor explained how when doing his PPL he had struggled with field selection during PFLs, and it was only when doing his instructor training that he learnt a method that felt much more intuitive to him. So today we’d be learning that method. Assess the wind direction & turn downwind. Lookout for smoke to give an idea of wind direction, failing that use the most recent wind direction you have been given (eg from the ATIS on departure). Pick a suitable field (more on choosing a field later) and nominate a 1000ft point. What’s up – check to see what might be wrong. Carb heat on, fuel – change tank, check magnetos, check primer is in and locked, throttle open, mixture rich, fuel pump on, check engine t’s and p’s. Obviously at this stage if you can restart the engine then you can continue to fly normally and don’t need to proceed to the next steps. Maydall call – Mayday x 3, Station you’re calling, Your callsign, Aircraft Type, nature of problem (eg Engine Failure), Attempting Landing in Field, Position, # of POB, Squawk 7700. Eg: Mayday, Mayday, Mayday, Gloucester Approach, G-GFCA is a PA28, Engine Failure, Attempting Landing in Field, 10 miles north west of airfield, 2 POB. Squawk 7700. Engine shutdown. As we can’t restart the engine, we need to shut it off. Fuel – off, magnetos – off, throttle – closed, mixture – ICO. Crash checks. Seat belts – tight, door unlatched, passenger safety brief, master switch off. The beauty of doing it this way (eg turning downwind) is that it makes field selection easier. Whilst flying downwind, you know that any field to your left or right is a potential landing site, as you can turn base and then on to final and be flying in to wind. Landing in to wind is important, as it enables you to land with the slowest possible ground speed. When you’re confident that you can reach 2/3rds along the designated landing site, extend the first stage of flaps. Extend the second stage of flaps when you’re confident you can make it to 1/3rd along. This all assumes you’re at a fairly reasonable height – say at or above 2500ft above ground level. If you’re lower than this, you’ll have less time in the air and may not be able to complete all those steps. Only attempt the checks that you have the capacity for. Below this height, to maximise available time, you may be better turning directly base (instead of turning downwind) and limiting your field selection to fields that are in to wind (eg on your left or right – not left and right). So what makes a suitable landing site? Ideally, it’d be an empty long length of tarmac, in perfect condition, with emergency services located onsite and a well-stocked pub. But if you don’t have an airport in range, you’ll probably be picking a field. Size – is it big enough to land and stop safely, allowing a reasonable margin for error? Surroundings – clear of power lines, phone cables, obstructions, etc on the approach path. Ideally the under and overshoot areas would make good landing sites too. After the briefing, I went out and did the A-check and got myself settled in to the plane. A couple of minutes later, we were taxying out to the runway. One thing I learnt today is to move throttle to idle before taking off the parking break. (When parked, we move the throttle to around 1200rpm.) Makes sense when you think about it – something I hadn’t picked up on before. We were soon up in the air and climbing to 3500ft. During the climb, I initially forgot to do the climb lookout (either by lowering the nose, or moving to the right and back to the left) – something I need to remember for future. During the first FREDA check, I completely forgot to check for carb icing until I was reminded by my instructor. Duh! We practiced quite a few PFLs at 2500ft as well as some lower level ones, where you really don’t have much time. Selecting a field and running through the steps felt ok to me. The hardest task was trying to explain which field you had picked, whilst surrounded by fields that all pretty much look the same! When we were happy that I’d practiced enough, we headed back to the airfield. I requested rejoin instructions from about 10nm out, and was told to report again at 3nm. I planned the approach so that I’d arrive at the airfield above the numbers of the active runway, with the runway on the right hand side (it was right hand circuits). After reporting at 3nm, we were transferred from approach to tower and given clearance to descend on the deadside. The next few minutes went pretty quickly – there were 3 aircraft behind us and 2 ahead. At one point, an aircraft requesting rejoin was told the circuit was full and to wait in the overhead. I hadn’t heard that before! After a stressful couple of minutes (doing lots of lookout and adjusting our track to fit in) we were had landed and were coming to a halt. Tower asked us to report runway vacated (the plane behind was on 1nm final) so we kept our speed up as we continued down the runway waiting for the exit on the left. After turning left (on to runway 18/36) I was about to report vacated, but my instructor corrected me. Even though 22 was the active runway and we had turned off it, we don’t “vacate” the runway until we cross the yellow lines, which using this exit meant after leaving 18/36. Another new one for me. All good learning. A quick de-brief back in the office and that was it for today. I’ll revise PFLs later on in the course as we get nearer to the final test. Next-up: navigation! After all the circuit lessons I’ve had recently, I was really looking forward to doing something different. Today’s lesson would be on advanced turning. “How can turning be advanced?”, I hear you ask. Well, essentially, it’s a fancy way of saying steep turns. These are steeper than the climbing turns (15 degrees of bank) and standard turns (30 degrees of bank) that I’ve been doing up until now. In the pre-flight briefing, I learnt that in normal flying we wouldn’t normally do any steep turns. The reason we learn them is primarily to practice it as a collision avoidance technique. I’m hazarding a wild guess that even without this lesson, if I saw a plane coming straight towards me I wouldn’t instinctively have done a ‘normal’ turn anyway – but hey. As the angle of bank increases, the wings have to create greater lift. You create greater lift by increasing the angle of attack. Much more back pressure is required when doing a 60 degree turn than when doing a normal turn. For a given airspeed, the angle of attack in the turn is greater than during level flight. This means the stalling speed is higher during the turn. You wouldn’t want to be doing a steep turn when flying slow (like turning on to final, for example) or low. During normal straight and level flight, the wings create sufficient lift to support the weight of the plane. During a turn, load factor increases. In a 60 degree turn, you’ll experience 2G. Fighter pilots can experience up to 9G. Aircraft are certified to withstand up to a specified load factor – typically around 3.8g for a light aircraft. The Va airspeed is the maximum airspeed at which full and abrupt control movements can be made, without risk of over-stressing the aircraft. If you’re above Va, you need to be very careful not to make any sharp control movements or you’ll risk breaking the plane, and nobody likes to watch a wing fall off. A steep turn to the left is slightly different, but to keep in balance you need to rudder right and left (because of the yaw effect from the increased power). When doing a steep turn, if you don’t apply enough back pressure you risk entering a spiral dive. The natural instinct is to pull back to try and stop the descent, but this is the wrong thing to do. Instead, you should move the throttle back to idle and roll the wings level (out of the turn). Then gradually pull back to reduce airspeed. Once airspeed is lower than Va, apply power and climb as normal. 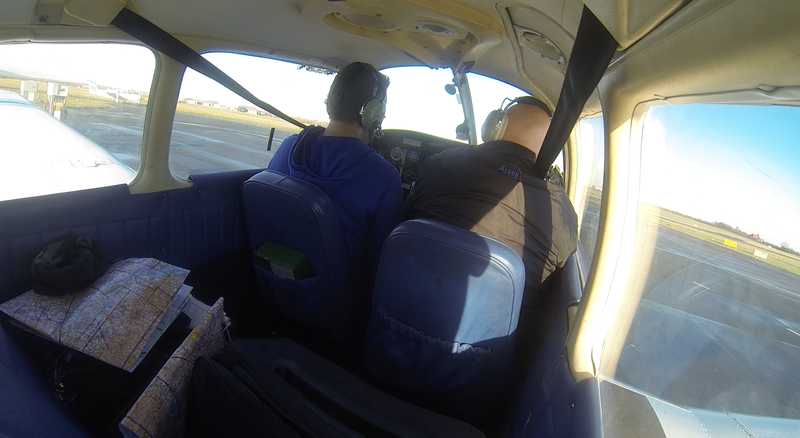 After checking the aircraft, we taxied out and were soon up in the air. We climbed to 3500 feet and carried out a HASEL check, having a good lookout to make sure nothing else was nearby. My instructor demonstrated a 60 degree turn. Wow. Feel the g-force! My cheeks felt pinned back and it was a struggle to move my arms. I wanted – no, needed – to have a go at this! My first 60 degree turn went ok. I underestimated just how much back pressure is required to stay level, but eventually worked it out. When rolling out of the turn I didn’t release enough back-pressure and we ended up about 300ft higher than when we started. After a couple more, I had the technique nailed and was able to do a level steep turn to the left and the right. 45 degree turns feel rather sedate compared to the 60 degree turns, whilst the 30 degree turn feels positively balmy after all that steepness. If only all turns could be at 60 degrees, it would be such fun (probably not for the passengers in the back though!). We intentionally entered a spiral dive and recovered using the correct technique. Like stalling, in the Warrior it’s a bit of a non-event really, so long as you follow the appropriate recovery technique. After a few more practices, we decided that we’d done everything we’d needed to for this lesson, so we headed back towards the airfield. On the way, my instructor put up the Instrument Screens – essentially big sheets of plastic that literally block the pilots view so that you can’t see out – to give me a taste of the IMC (instrument meteorological conditions) lesson coming up. When you qualify as a PPL, you’re only allowed to fly in VMC – visual meteorological conditions, which are a set of rules specifying visibility, distance from cloud, etc in different classes of airspace. Essentially, you need to be able to see the ground so that you can navigate based by the features of the ground. To fly in worse weather conditions (eg. fly in IMC conditions) you need to be either Instrument Rated or have an IMC licence. The PPL syllabus includes an hour of IMC instruction designed primarily (I think) to scare people from wanting to intentionally try a flight in IMC. So, with the screens up (and my instructor acting as the lookout – he had full visibility) I had to perform a series of manoeuvres like flying straight and level, regular turns, climbing and descending. I’ll go in to this more after having the full IMC lesson, but basically you need to learn to trust the instruments and ignore your human instincts. Your inner ear easily gets confused and gives you the sensation that you’re climbing or descending when in fact you could be doing neither. There’s a certain order and frequency you need to monitor each of the instruments, and the workload is insane. I think I managed to fly pretty well using the instruments and didn’t find it very scary. My instructor seemed to agree as he said “you’ve obviously spent way too long on flight simulators”. A fact, sadly, I can not argue with. Apparently that format can be used pretty much in any situation where you’re unsure of what to say. Another week, another mnemonic to learn. I wanted to practice overhead joins (I’ve only done one) so I asked for one, even though we were flying south towards the airfield and the active runway was 18. ATC obliged and asked us to report 3 miles from the field. We did so, and were handed over from Approach to Tower. Tower then asked us if we would mind taking a direct join on final so we agreed and after a relatively smooth landing, it was all over for another few days. Here’s a little video clip of me doing a 60degree turn. The audio didn’t record for some reason, so excuse the crappy dubstep. Look at how steep everything looks out of the window – it really was like that! Lesson 19 – final circuit consolidation! The Aeros PPL syllabus requires around 3 and a half hours of solo flight before finishing the solo consolidation and moving on to advanced turning, PFL and navigation. I made a mistake whilst adding up my time last lesson and had overestimated how much time I had flown solo – it was 2 hours 55. So today would be another (hopefully final) lesson of circuit consolidation to build up my solo hours. Out to the apron, I did the A-check and prepared to get going. The ATIS reported 6knot wind from 160, and runway 18 was active with left hand circuits. I was excited at the thought of finally getting to do some left-hand circuits. However my excitement didn’t last long! After completing the start-up checks and getting ready for taxi, the time was now 11.25 so I had to re-check ATIS (it updates at 25 and 55 minutes past each our). The active runway had changed to 22, with right-hand circuits, so I’d be flying the same pattern as last lesson. Nevermind! I did three circuits with my instructor: one normal, one flapless, and a glide approach. Everything seemed to go well – I made the glide approach ok although it was fairly close. I put the first stage of flap in a little earlier than ideal, but it worked out ok. The idea with a glide approach is that you should be sure that you can reach two thirds up the runway before using flap. Then, with one stage of flap, you should be able to make it to one third up the runway. Only when you are absolutely sure you will make it to the threshold should you use the final stage of flap. Without any power, you don’t have the option of regaining height so you must be super careful to keep as much altitude as possible (by maintaining best glide speed). We landed after the glide approach, and my instructor jumped out, leaving me to go solo. I flew five circuits. The first couple were quiet (I had one ahead) but then things became progressively busier – at one point I was number 5. A couple of left orbits were necessary for spacing (one of which I requested when the Technam in front was a little close for comfort) which sorted everything out. Although the reported ground wind was only 6 knots, it seemed to be much stronger at circuit height. On the upwind leg (after take off) the nose attitude needed to be lower than normal to attain the standard climb speed of 79. Equally, on downwind the airspeed went up to 125 at one point (it’s normally 100) which gives you even less time than normal to do all the downwind checks and radio call. After the five circuits, I called it a day and taxied back to the Aeros apron. I have now completed 3 hours and 40 minutes of solo flight time, enough to move on to the next stage of training. Wahey! Another day of circuit consolidation. I had a different instructor to last lesson, so we started off doing 3 circuits together. I decided to go-around on my first landing as my speed was a little high and I thought we risked a rather large balloon. My instructor said (afterwards) he thought I could have landed just fine, but was good to see I was able to make the decision myself. It’s always better to be safe than sorry! We did 2 touch and gos together, before stopping for the instructor to jump out. We were on runway 22 today, which I had not done circuits on before, so I was quite glad to do the first few with the instructor whilst I got used to the ‘feel’ of it. Whilst there’s not a huge difference between 22 and 27, 22 doesn’t have a noise abatement procedure on right hand circuits, so the initial upwind leg felt a bit different. I then did a further 7 solo circuits, which took about 55 minutes, before heading back. The circuit became busier and busier – there were 5 remaining in the circuit at one point – so there were lots of orbits and extended downwind legs. On my second solo circuit I had to extend downwind and ended up doing a 3.5m final. For a couple of seconds I felt a bit disorientated – I couldn’t see the airfield (I could, I just wasn’t focusing at the right distance) but I trusted the instruments (the ADF was tuned) and the general timing of the pattern and found myself pretty much lined up on the extended centreline at 3 miles. Goes to show how easily/quickly it can happen though, without the familiarity of the visual reference points (GCHQ for runway 27) you’re used to. I forgot to start the GPS recorder, so no tracks this time. Next lesson should hopefully be either advanced turning or practice forced landings (PFLs). Both of which require considerably better visibility than is needed for circuits, so I may have a longer wait for my next flight than usual…Fingers crossed.